When I first learned of The Gentle Barn, I fell in love with them right away! They rescue abused animals and give them sanctuary in their forever home ~ their barn. They bring at-risk youth to their barn to meet the animals (hug cows, rub on piggies’ bellies) and to help those youth heal. And they offer a very kind and compassionate message towards a more compassionate world. I have never heard them speak a terrible word about anyone even though the animals are always rescued from a very horrible situation (and a person less evolved like myself would have plenty to say about people who do that!). So I admire them in so many ways. The Peace Alliance just launched their Faces of Peace project. Go check it out and make sure you see Richie’s page. He is the co-founder of Challenge Day. I know him personally and I can say ~ he so deserves to be there. Another cool person who also deserves to be a “Face of Peace” is Ellie Laks. 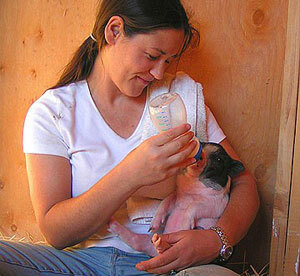 She founded The Gentle Barn in 1999. I am going to visit The Gentle Barn next Sunday as part of my BOSS HOGG TOUR. Can’t wait to give Buddha a hug (and all the other animals)! As a vegetarian, one of the areas I am passionate about is peace on this planet. I believe that the choices we make around food can create peace or create suffering. I hope you will join me for the IMAGINE ~ Peace Conference 2011. This historic event will be held on September 10-11, 2011 at UC Berkeley – on the 10th Anniversary of 9/11. I am also working to help them bring vegetarian and/or vegan options of food. I have been contacting local places to get the word out and invite them to cater or be a part some way. I would love your thoughts on how to make this happen.